Every couple of years the tech industry shifts back and forth between a focus on cloud-based technology/solutions and those that sit at the customer site. Over the last two years, it has been increasingly obvious that we are squarely in a swing towards cloud-based solutions. Just in the CAD market alone, we’ve seen the influx of platforms like OnShape and Autodesk Fusion 360, both of which have gained wide traction in the market. The most successful companies hopping on the technology trend bandwagon focus more on evaluating the fit between their product plan and the strength of said technology than on the short-lived attention they’ll receive from saying they are “cloud-based”. 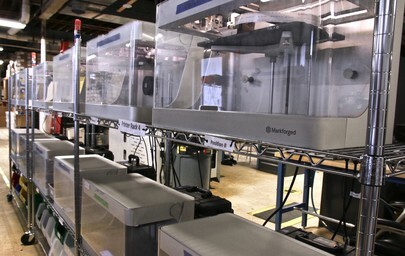 The strengths of cloud based software aligned with the goals we set for our software platform: integration across each component of the Markforged 3D printing experience, an organized platform for professional use, and a simple yet intelligent interface with our unique machines. Each tool is complemented by the others – the powerful interface of Eiger connects the dots between materials and manufacturing. But it is more than just a 3D printing slicer – the cloud based program that controls Markforged printers grew out of modern work methodology. 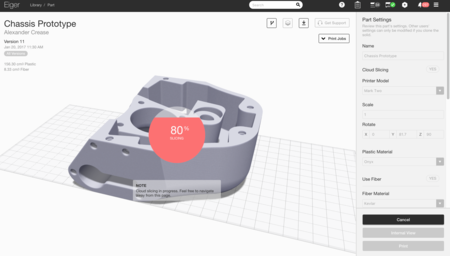 As a organization-based project management tool combined with a 3D printing slicer, Eiger makes it easy to set up and monitor production quality prints regardless of the number of printers or people in an organization. 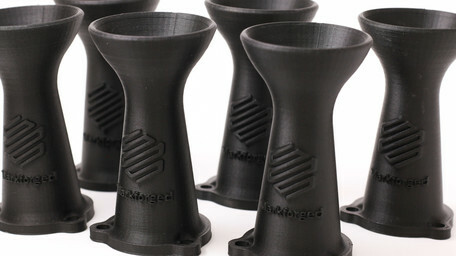 Below we’ll cover five valuable benefits of our cloud based 3D printing software. As more cloud based design systems appear, from things like Onshape’s browser based CAD platform to Adobe’s Creative Cloud, cloud based systems are no longer just about computation and interface but also data management. Eiger acts as a file management system for all of your printing files, allowing you to sort designs into specific projects. This allows you to easily find, edit, and update designs. All designs are saved in the cloud, so no files are lost, even if your computer crashes. Don’t worry about accidentally overwritten or deleted files on a local corporate storage system. Version history is built in – any updates to the part design or its settings are logged and can be recovered at any time. Eiger allows you to work more efficiently as a team through its fusion of file management and manufacturing setup systems. ‍Eiger’s cloud based slicer and file management system includes built-in version control. Another popular asset to cloud based systems is how easy it is to collaborate on team projects. This is why many engineering design programs are adopting cloud systems: it makes teamwork Eiger is organization based, so you can give anyone on your team access to the program. Easily share files with your teammates for collaboration, and make suggestions or edits to improve their designs remotely. ‍Cloud-based software expedites teamwork and improves collaboration, even remotely. Cloud based systems lead the way to more agile development – with simplified collaboration, decrease product development time by working together. 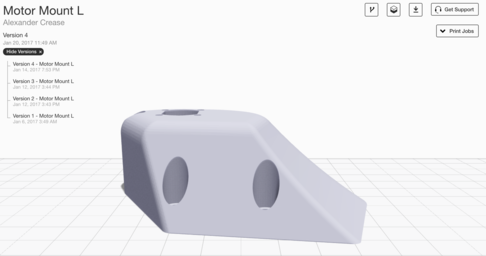 One colleague can design a part and start the print while another can check its status and pick it up once complete. As more companies move toward agile structures, Eiger provides professional collaboration for engineers using our machines for anything from research teams to product development. Eiger’s browser based platform means you can access print files from any computer, allowing you to edit print settings and fiber routing options anywhere. That’s not the only thing Eiger has to offer. 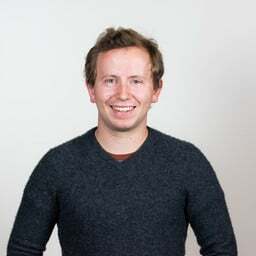 Every Markforged printer can be internet connected via ethernet or wifi, meaning you can access your printer from anywhere via Eiger. And we’ve even taken it a step further: our printers will email you when they run low on material, complete a job, and more so that you know exactly how your print is going. ‍Monitor prints and check in on printer status from anywhere. Whether you have one printer or one hundred, our integrated system makes it easy to remotely monitor prints. 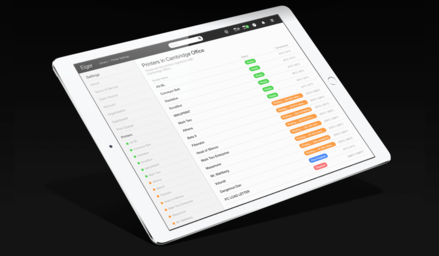 Eiger gives you the power to manage your network of Markforged printers and check print status all in one simple tool. Our ever widening product portfolio includes printers with cameras, in-process inspection utilities, and other sensors that will send you quality updates mid-print. With Eiger access from anywhere, monitor prints from wherever you may be. Cloud based slicers like Eiger get automatically updated to bring the latest features to your system. Access new feature enhancements as soon as they are available: without another package install onto your computer. The cloud-based system also ensures easy access to help. For questions and support, the program can link you directly to a support team. With cloud based programs, you can work with unparalleled efficiently and ease as each update is designed to improve your experience. Cloud-based computing programs aren’t limited by system requirements – all computing occurs on a server independent from your machine. As a result, the program has the capability to handle large files, even while you are working in other programs with Eiger’s window minimized. ‍Eiger does all its computation on a server, meaning no computer processing is needed when setting up a part for printing. Cloud based systems grew out of modern trends in professional product work environments, where cycle time, collaboration, and agile development are key. Eiger takes this workflow to the next level by integrating cloud based systems with modern manufacturing solutions. By doing so, it breaks down the barriers many engineering teams face turning an idea into a product. To learn more about Eiger and test its full potential, request a free trial here. Print with half-spools of filament without worrying that you will run out mid-print. Outsource slicing to the cloud so you can focus on other tasks. 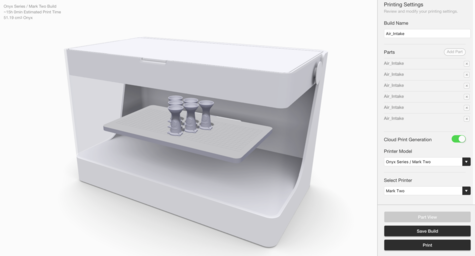 At Markforged, we are leveraging key features of our highly reliable and integrated system to scale manufacturing of sample parts. Our internal “print farm” functions as an efficient and easily implementable 3D printing factory. We're proud to introduce a new line of printers: The Onyx Series. With the Onyx One and Onyx Pro, we're making Onyx accessible throughout our product line.